Click to select the formula in the top cell. If you’re still editing the formula, press Ctrl-Enter to save and stay in the cell. Navigate to the top cell containing the formula. If you’re still editing the formula, press Ctrl-Enter to save and stay in the cell. Press Ctrl-C to copy the formula. 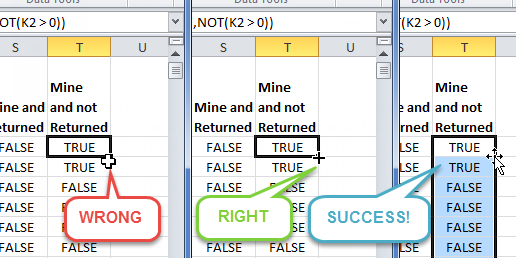 Press the down arrow to move to the cell directly below the copied cell. Press Ctrl-Shift-End to select the range of cells including the target cell and extending down until an empty row is reached. Press Ctrl-P to paste the formula into the selected range of cells. That’s it! In either case, the formula is copied down to all cells in the column until an entirely blank row is reached, so make sure you have at least one cell in every row filled in, or the copy down process will stop at the empty row. With either method, you can verify by pressing Esc to clear any selection, then Ctrl-Shift-End to jump down to the last updated row.